Miles will feel like metres. The ASICS Men’s Gel-Quantum 360 4 Running Shoes promises consistent performance and endurance to the max. The range of features, design technology and innovation means it’s one for runners who take both their shoes and sport seriously. 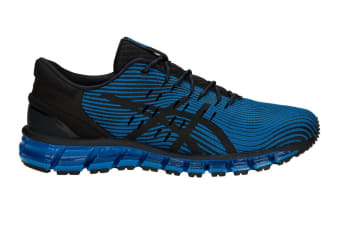 In true lightweight style, the ASICS Men’s Gel-Quantum 360 4 Running Shoes have been created with ASICS’s Trusstic System technology, which leaves the sole unit buoyant, without sacrificing the shoes’ structure. Supported with 360deg of ASICS’s GEL Cushioning technology, you know it’ll be a shock-absorbed landing, followed by a comfortable toe-off. And with comfort a priority, the seamless construction and FluidFit upper means friction caused by traditional creases and seams is eliminated, while stretch mesh contours around your foot so the shoes can fit like a glove.